It is probably fair to say that most people in the western world have at one time or another played tetris. Fewer still have never heard of it. This is likely to make it one of the most popular things to ever come out of the Motherland. I certainly cannot think of another hit game to have done. Developed in 1985 by Alexey Pajitnov the game has taken the world by storm. Indeed you can get it now on pretty much any device you care to mention. For this reason it must be asked: did the wii really need a tetris game? While that answer would usually be no it is in this case a resounding yes because the team has done such a good job in turning what is usually a relatively lonely and solo experience into a party piece that everyone wants to play. For the criminally uninformed Tetris involves slotting blocks of different shapes together to make lines which then disappear and give points. You keep playing until you reach the top of the screen at which point you lose. Therefore the aim is to get combos of multiple lines at the same time to get more points. It also gets faster as you go along. 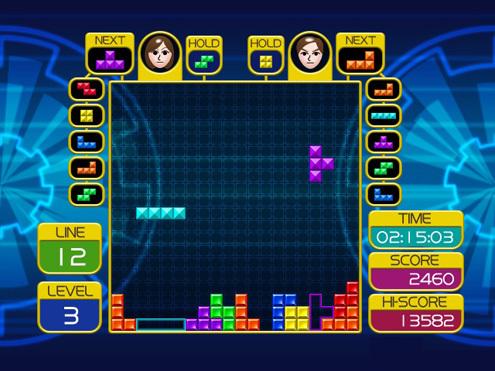 What Tetris Party adds to this formula is a multiplayer system whereby if you remove two lines or more at a time those lines get added to the other players screen thus moving them slightly closer to the peril of the top of the screen. It also adds online battles where you frantically try and beat someone you have never met. Add into this a host of modes which include co-op play where you get a table twice the width and have to work together to clear it or stage racer where you have to race to get to the bottom of an assault course first with assorted tetris blocks. All the modes make this the perfect game for someone who loves Tetris. Get your friends round for this game and they will enjoy it. The controls work and are functional but can get a bit of getting used to as everyone has played Tetris in different ways. For the crazy there is even the option of using a wii balance board in the game. Not having one though I couldn’t test it out. Whether you want to play it alone or with friends Tetris party is perfect for those who enjoy the classic game. It adds a multitude of new features to the old formula some are better than others but none detract from the package. The controls take a little bit of getting used to but once you are there is no stopping you from getting as addicted as possible in another Tetris Game. Want a big sales push? You can compare your score to everyone else with the game in the world… I am 1,102 at last checking but slowly slipping down the rankings. Also the game is only 1,200 wii points which is a total of £8.50 making it amazing value for money when you consider some of the pap sold for wii at the full £39.99 price point.